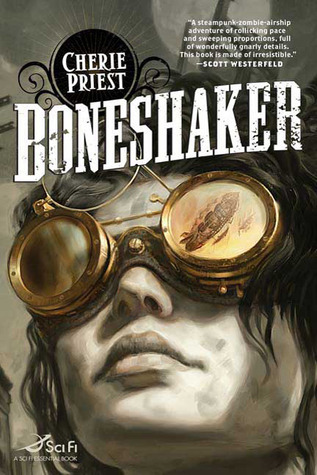 Boneshaker was my first real endeavor in the steampunk world. I challenged myself to read some steampunk books this year because I’d always found the concept fascinating, I’m practically in love with the clothing and I was wondering if the books would appeal to me in the same way. After reading Boneshaker I can safely say that it does (well, at least, I really enjoyed Boneshaker). I was hooked from the very first page. The writing is captivating and reads fluently. I liked the background story and the little introduction in the beginning that tells the tale of the Boneshaker destroying Seattle. In the wake of this destruction a gas was released in the city, nobody really knows where it came from, but it had devastating consequences. Everybody breathing in the gas either died or turned in to a “rotter” (a zombie). So they put up these huge walls to contain the gas and started a new live outside these walls, in the Outskirts. Zeke, the son of the creator of the Boneshaker wants to clear his father’s name and goes in to the city to look for evidence in their old house. Briar, his mother, sick with worry, decides to follow him and get him out. It was really refreshing to read a story about the relationship between a mother and her son, instead of the many romances I’ve read last year. My favorite character is by far Briar, and Lucy, Swakhammer en Cly make a really good set of secondary characters. But, although I could understand his motivations and some of his actions, I never really connected with Zeke. But I didn’t really mind that much because I had a lot of other characters I did connect to that kept the story going for me. The middle of the book is fast paced and full of rotters-action: edge-of-your seat kind of stuff, moments where I wanted to scream "Run!!" in the hope the characters would respond and get the hell out of the mess they were in. They usually did, so I might have a special book-power like Mo from "Inkheart". (How I wish that were true). I'm glad the author put in a few injuries and losses to make the story more realistic and fortifying the feeling that no one is save inside the city and surviving is one hell of a difficult job down there. Once they were both in the city for a while, however, the pacing seemed to stutter to a halt. The first halve of the book had been so fast paced, it took me by surprise and slowed down my reading. Luckily the pacing picked up again nearing the end, which was quite satisfying. Some of the technical devices were a little hard for me to imagine, which is a bit annoying, because those left a blank in my mind. I'm imagining the whole scene but sole areas are fuzzy because I'm not really sure how they're supposed to look like. I wonder if the reason for this is that English isn't my native language or if it has nothing to do with me at all. The fact I can't quite imagine all the devices puzzles me a bit, because we do get enough description for them, any more and it would be too much. So maybe it’s specifically a problem that only I have experienced? All in all, I really enjoyed Boneshaker and I will definitely read the next installment in the series. I would recommend this book to anyone who wants to experience steampunk for the first time.